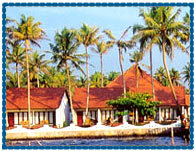 Hotel Abad Whispering Palms Kumarakom, Abad Whispering Palms Hotel Kumarakom, Reservation for Hotel Abad Whispering Palms, Kumarakom, India. 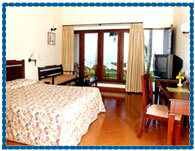 Address: Abad Whispering Palms, New Nazareth Road, Kumarakom - 686563, Kerala, India. Accessibility: 70 kms. from Airport, 16 kms. from Railway Station, 19 kms. from Bus Stand. Hotel Abad Whispering Palms is located at the most exotic resort destination in Kerala - Kumarakom, on the bank of the Vembanadu Lake. Hotel is built in traditional Kerala style, set amidst natural backwater setting, providing the relax and tranquility to its guests. Hotel offers 42 air conditioned cottages having an ethnic ambience and fully equipped with the modern facilities like fridge, television with satellite channels, telephone and attached toilets. Multicuisine Restaurent, Fitness Centre, Swimming pool with Jacuzzi, Ayurvedic Centre, Conference Hall, Activities Room, Currency Exchange, Room Service, Laundry, Business Centre, Play Area for Kids, Travel Assiatance, Doctor on Call, Utility Shop, All Major Cards Accepted, Ample Car Parking, Boating In Lake.